What is a Boom Lift Used for and Can a Boom Lift Be Used as a Crane? For many years, boom lifts and cranes have been used to lift and lower heavy loads and reach otherwise inaccessible heights. Dating back to ancient Greece, lifting mechanisms and crane-like structures have helped people build multi-story buildings and amazing structures. One example is the Colosseum, which still stands today. Today’s structures are built by machines that would’ve made the ancient Greeks green with envy. While the simple mechanisms of yesteryear were certainly impressive, they can’t stack up to today’s cranes, boom lifts, and other types of aerial lifts. The equipment of yesteryear is no match for the typical lift used in construction today. From carrying capacity to reliability and other performance factors, a boom lift used in construction offers many advantages over ancient lifting equipment. Since this equipment is used in construction for similar tasks – lifting, hoisting, elevating workers to heights, etc. – many people wonder how safe it is to combine the two. For example, can a boom lift be used as a crane? After all, what is a boom lift used for? Basically the same thing as a crane, right? However, while boom lifts and cranes seem like very similar machines, there are many differences between a boom lift vs crane. Learn what they are here – and why you should never use equipment for something it wasn’t designed for. Cranes and boom lifts are both used in construction, maintenance, painting, electrical power line work, window glazing, and many other industrial tasks. But when it comes to their actual function and what they’re designed to do, that’s where the similarities end. 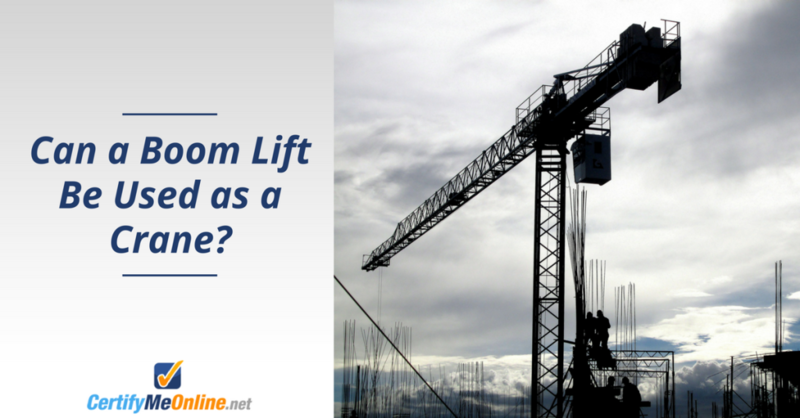 Let’s look at the main differences between a crane and a lift used in construction. Boom Lift Vs Crane: What Are the Differences? The main difference between a boom lift vs crane is that boom lifts are used for lifting workers and their equipment to work sites at height. They are used to help build structures and maintain them, in addition to power line work, window washing, and tree care. Cranes don’t have a bucket platform for holding workers. They are only used for lifting and moving extremely heavy loads. Unlike any boom lift, cranes use a series of chains, cables, pulleys, and concrete blocks to lift the crane arm and counteract the weight. Boom lifts are classified as vehicle-mounted devices used to lift people. The base of the boom lift rests on wheels or on stabilizing “feet”. Workers are lifted and lowered while standing on the bucket platform attached to the boom arm. This is the base mechanism that allows aerial lifts to be used in construction and a wide variety of other jobs. What is a Boom Lift Used For? Boom lifts are used on construction sites, maintenance sites, and in both rural and urban areas for reaching power lines. If a height is unsafe for reaching with a ladder a boom lift is used. Some boom lifts can extend hundreds of feet into the air. The JLG 1850SJ, one of the most popular boom lifts in the world, reaches over 185 feet! Boom lifts are used for all types of job requirements, including any situation that requires safe and stable elevation of workers and material. Boom lifts used in construction require training and a general understanding of U.S. Occupational Safety and Health (OSHA) safety requirements. CMO offers training packages to help you become OSHA compliant, which is beneficial for you and your employer. You’ll have the proper credentials to operate aerial lifts used in construction and other jobs, while your employer will enjoy the advantages that come with a properly trained, safety-first workforce! Cranes are often used on construction sites, but for lifting and moving building materials and heavy equipment like trucks and forklifts. Specialty models can even be used to move trains. Cranes are only used to lift material, equipment, and other objects – but not workers. That’s the main difference between cranes and lifts used in construction. Speaking of which…can a boom lift be used as a crane? Can You Use a Boom Lift as a Crane? No, you cannot. Boom lifts and cranes are made for different jobs and are not designed for the same capabilities. A boom lift may not have the same lifting and moving power as a crane, and a crane is not able to accommodate workers. When looking at a boom lift vs crane, a boom lift can be overloaded and damaged when used as a crane, potentially causing injuries or death. OSHA guidelines prohibit the use of boom lifts for cranes and vice versa. When using industrial equipment, ask yourself what the machine’s main purpose is. What is a boom lift used for? What are the main reasons to use a crane? Use the equipment for what it was intended for – but never use one machine to substitute for another. Not only is it against manufacturer instruction, but OSHA also sets strict standards for using boom lifts and cranes safely. According to OSHA regulations, workers need to be trained to operate boom lifts and aerial lifts. Training must cover how to avoid hazards like falling from an elevated height, falling objects, ejections, electrocutions, structural failures, entanglement, and contact with objects and overhead objects. Now that you know to never use a boom lift as a crane, you need to invest in boom lift training to learn how to use a boom lift vs crane and to protect your safety on the job. Visit CertifyMeOnline.net today to learn more! Learn More About Another Type of Boom Lift: The Knuckle Boom Lift! There are a handful of boom lifts used throughout the world today. Most of these boom lifts are used for construction, painting, maintenance, repair, window glazing, landscaping, and other tasks. But were you aware of the knuckle boom lift? What is a knuckle boom lift used for? In this informative post, our boom lift experts review the unique aspects on the knuckle boom lift, including its basic design, common applications, the types of jobs that use knuckle boom lifts, knuckle boom lift training, different worksites where this type of lift excels, and much more. If you’ve ever wanted to know more about the knuckle boom lift, check out this blog today! You Know Lifts are Used in Construction…But What Else are They Used For? A lift used in construction is probably the most common workplace application. But did you know there are many other uses for aerial lifts, aerial work platforms (AWPs), and other similar equipment? In this post, we had our training experts gather offbeat, uncommon, and even unexpected uses for the common aerial lift and AWP. Safety inspections, orchard maintenance, landscaping, special event assistance, concerts & sports events – you name it, and the trusty aerial lift or AWP is always ready to go! Find out more about how aerial lifts used in construction are capable of doing much more than you originally thought! This entry was posted in Aerial Lift Training on January 22, 2018 by admin.